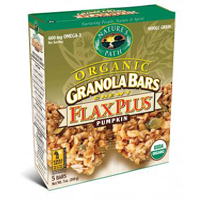 Don't let the word "flax" scare you- this bar was actually pretty good! Similar to a Rice Krispie treat in consistency, this bar was chewy, soft and moist. There were flax seeds and pumpkin seeds dispersed throughout the bar, which kept their shape and form but didn't take away from the soft and chewiness of the bar. It was sweet, but not overly sweet, and had a good amount of flavor. It's certainly a light snack, and something I would probably eat for a quick boost before hitting the gym as I feel I would be hungry shortly after if I ate it alone. However, I would eat it again!